The English football league system, also known as the football pyramid, is a series of interconnected leagues for men's association football clubs in England, with six teams from Wales and one from Guernsey also competing. The system has a hierarchical format with promotion and relegation between leagues at different levels, allowing even the smallest club the theoretical possibility of ultimately rising to the very top of the system, although in practice it would take a team at the bottom levels at least two decades of consistently finishing at or near the top of each successive league to reach the top level, and even then additional restrictions, particularly in regard to stadium facilities, would then come into effect at the highest levels that could prevent a club from being allowed access to the top levels. There are more than 140 individual leagues, containing more than 480 divisions. The exact number of clubs varies from year to year as clubs join and leave leagues or fold altogether, but an estimated average of 15 clubs per division implies that more than 7,000 teams of nearly 5,300 clubs are members of a league in the English men's football league system. The pyramid for women's football in England runs separately to nine tiers and some English-based men's clubs play outside the English football league system. The creation of the Football League was in 1888 by Aston Villa director William McGregor. This was dominated by those clubs who had supported professionalism, and the twelve founding members consisted of six from Lancashire (Blackburn Rovers, Burnley, Bolton Wanderers, Accrington, Everton and Preston North End) and six from the Midlands (Aston Villa, Derby County, Notts County, Stoke, West Bromwich Albion and Wolverhampton Wanderers). No sides from the South including London initially participated. The system consists of a pyramid of leagues, bound together by the principle of promotion and relegation. A certain number of the most successful clubs in each league can rise to a higher league, whilst those that finish at the bottom of their league can find themselves sinking down a level. In addition to sporting performance, promotion is usually contingent on meeting criteria set by the higher league, especially concerning appropriate facilities and finances. In theory it is possible for a lowly local amateur club to rise to the pinnacle of the English game and become champions of the Premier League. While this may be unlikely in practice (at the very least, in the short run), there certainly is significant movement within the pyramid. The seven levels immediately below the Premier League and Football League are known as the National League System and come under the jurisdiction of The Football Association. It evolved over many years. In the most recent major re-organisation, two new leagues were entered at level six – the Conference North and Conference South (now National League North and South) – shifting the top divisions of the Southern League, Isthmian League and Northern Premier League down to level seven. In May 2014 The Football Association announced provisional plans for a new division between the Football League and the National League which would include "B" teams of higher level clubs. The English football league system does not include the amateur version of the game often called Sunday league football. These leagues are independent entities with no promotion or relegation involving the football pyramid. However, some Sunday League clubs have been known to join pyramid leagues if they desire to progress higher. There are also some Saturday leagues such as the Lincolnshire League which are not officially part of the pyramid, although teams frequently leave these for pyramid leagues. At the top is the single division of the Premier League (Level 1, which is often referred to as the "top flight"), containing 20 clubs, all of which, up to the 2010–11 season, were based in England. However, two Welsh teams (Swansea City and Cardiff City) have joined as of the 2011–12 season and the 2013–14 season. Cardiff City have since been relegated to the Championship. Below the Premier League is The Football League, which is divided into three divisions of 24 clubs each: The Championship (Level 2), League One (Level 3) and League Two (Level 4). The 92 clubs in the Premier League and Football League are all full-time professional clubs. They are often referred to as 'League' clubs because, before the establishment of the Premier League in 1992, the Football League included all 92 clubs, in four divisions. Clubs outside this group are referred to as 'non-League' clubs, although they too play most of their football in league-type competitions. The top tier of non-League football is the National League, which contains a national division (National League) of 24 clubs (Level 5), this is the lowest level with a single national league. There are two divisions at Level 6, covering the north (National League North) and south (National League South), with 22 clubs each. Some of these clubs are full-time professional and the others are semi-professional. Below the National League some of the stronger clubs are semi-professional, but continuing down the tiers, soon all the clubs are amateur. Lower-level leagues also tend to cater for progressively smaller geographic regions. 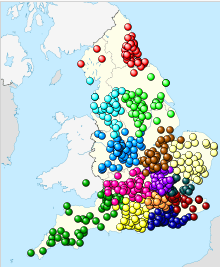 Next down from the National League are three regional leagues, each associated with different geographical areas, although some overlap exists. 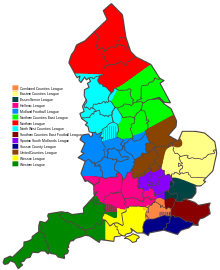 They are the Northern Premier League (which covers the north of England and north Wales), Southern Football League (which covers the Midlands, south and southwest of England, and south Wales) and the Isthmian League (which covers the south east of England). All of the leagues have a Premier Division of 24 teams (Level 7). 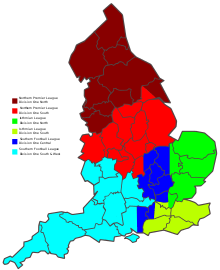 Below these, and split by region, the Northern Premier League and Southern Football League each have two parallel divisions of 22 teams (Level 8). The Isthmian League has two parallel level 8 divisions of 24 teams each. National League (level 5, 24 teams): The champions are promoted; next four compete in playoffs, with the winner gaining the second promotion spot. The bottom four are relegated to either North or South division as appropriate. National League North and National League South (level 6, 22 teams each, running in parallel): The champions in each division are automatically promoted; next four teams in each division compete in playoffs, with the playoff winner in each division getting the second promotion spot. The bottom three teams in each division relegated to either Northern Premier League, Southern League or Isthmian League as appropriate. If, after promotion and relegation, the number of teams in the North and South divisions are not equal, one or more teams are transferred between the two divisions to even them up again. Northern Premier League Premier Division, Southern Football League Premier Division and Isthmian League Premier Division (level 7, 24 teams each, running in parallel): The champions in each division are automatically promoted; next four teams in each division compete in playoffs, with the playoff winner in each division getting the second promotion spot. The bottom four teams in each division relegated to a level 8 division as appropriate. If, after promotion and relegation, the number of teams in the divisions are not equal, one or more teams are transferred between the three divisions to even them up again. Northern Premier League Division One North, Northern Premier League Division One South, Southern Football League Division One Central, Southern Football League Division One South & West, Isthmian League Division One North and Isthmian League Division One South (level 8, running in parallel, 22 teams in each of the Northern Premier League and Southern Football League level 8 divisions, and 24 teams in each Isthmian League level 8 division): The champions in each division are automatically promoted; next four teams in each division compete in playoffs, with the playoff winner in each division getting the second promotion spot. The bottom two teams in each Northern Premier League and Southern Football League level 8 division and the bottom three teams in each Isthmian League level 8 division are relegated to a level 9 division as appropriate. If, after promotion and relegation, the number of teams in the divisions are not equal, one or more teams are transferred between the divisions to even them up again. For details of changes made below the level of The Football League, see History of the English non-League football system. Level one in the pyramid, the top division of English football, is run by the Premier League (which gives its name to the competition in that division), the winners of which are regarded as the champions of England. Levels two to four are run by the Football League. Together, these four divisions make up what is known as "league football". The leagues below level four are classed as "non-league football", meaning they are outside the Football League. The leagues at levels five to eleven comprise the National League System (NLS), and come under the direct jurisdiction of the Football Association. The top level (level 5) of the NLS is known as "Step 1" by the FA, the next (level 6) as "step 2", and so on. ↑ "Thepyramid.info: Statistics". 7 November 2006. Retrieved 19 January 2007. ↑ The Football Association. "Leagues: Steps 1–7". thefa.com.